Thorne Cottage stands within walking distance of Huish Park - home to Yeovil Town Football Club. Handsome Georgian building on a quiet country lane. 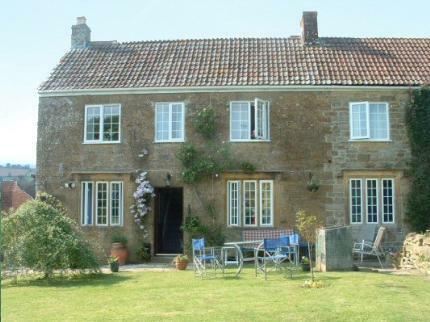 This charming guest house offers affordable bed and breakfast accommodation in a quiet rural hamlet near Yeovil in Somerset. There's lots of pluses here. Great views of the surrounding countryside can be enjoyed from the garden (which has a picnic-come-beer table,a Summerhouse and a relaxing wooden swing seat) and the furnishings in the bedroom have a fab rustic quality perfectly in keeping with the farmhouse feel of the place. For the most part the bedrooms are immaculate and cosy and although perhaps a little too floral for some tastes, there's a real sense of warmth and character. All bedrooms are situated on the upper floor and feature FREE Wireless internet access and brand new flat screen TV/DVD players (with freeview). Although a full English breakfast is served daily in the dining area, the Carpenters Arms pub is within walking distance. The pub does a good line in home-cooked pub food available 6 nights per week. The closest bus stop (from Yeovil town centre ) is approx 3/4 Mile from Thorne Cottage.